Just to qualify those two graphs a bit more. 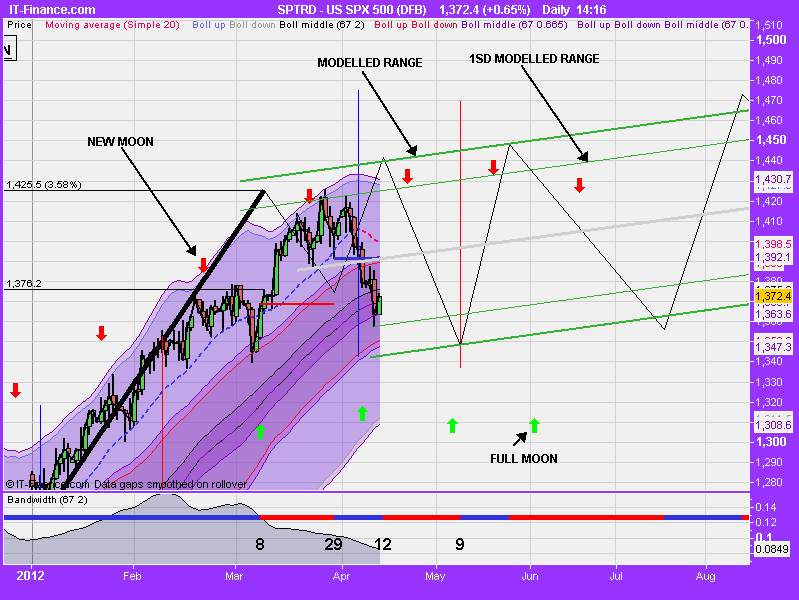 The equity model: It predicted the low on the 23rd Nov and then suggested the rapid move up to 1425 by March 8th. It got to 1425.4( by IG) a couple of weeks later, and when it traded above the modeled price, the price struggled so it seems on course. Time will tell. 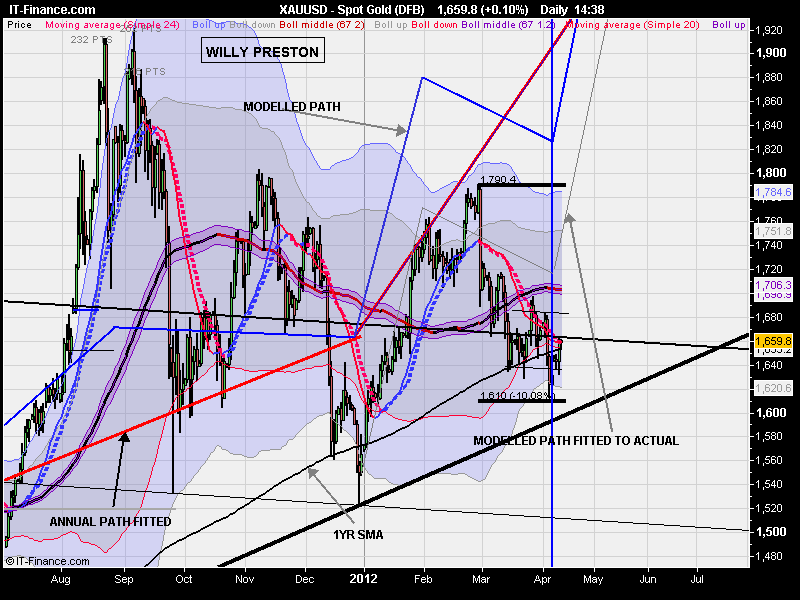 Gold: She is a cruel mistress at the best of times! The first question is ….Has the finale been or is it due? Taking rhymes from the Tech bubble by my reckoning as long as the price remains above about 1486 we are still potentially on for something more major. I posted this a while back but here it it again. This is the tech bubble with major tops marked. Stages 1 – 5. Stage 5 being the finale. Below are the same levels attached to Gold (black horizontal lines) and the red lines are a 3.2 % offset for a slightly different starting price. It can be seen that provided the price is above 1486 ….we are still on for stage 5. By John’s analysis( which I am a huge fan) it looks like the drivers for a Gold price appreciation environment is in place from now. But according to purely political cycle analysis it is most likely to occur in yr 3. i.e. Either in 2011 or 2015. If the analysis is to stand up then certain things should have already taken place. You would expect 1979 to be a Yr 3 …and it was and you would expect at the very least 2011 to have exhibited Gold price strength …which it did. The corollary of this is that if by price we are still on for a finale then the period of particular strength will be from the beginning of the next phase 2 which starts next July and the phase two we are in now will produce lower returns. The problem is my new gold model is throwing up some fancy target figures for this summer which is at odds with being in phase 1. So I think it is right to be long here and review in Aug. I hope this has been interesting…. Couple weeks ago I mentioned the GTU weekly Sto buy signal of dropping below 20. At the time it was around 33, Friday it got to 18 and is now at 23, seemingly a buy but being a weekly chart the brief dip below 20 doesn’t register. It usually stays below 20 for 1-3 weeks which is one reason I don’t think it has quite bottomed. Nonetheless my gold basket is about half full. With ZIRP (now possibly through 2015), Twist, MBS repurchases, Euro swaps and all the liquidity measures by Europe, China, and soon more from Japan, Gold indeed does not need further QE to rise. However, the Fed minutes, which have nothing to do with the actual meeting and are purely intended to manipulate the market, were saying no QE if commodities prices pressure and no QE if the stock market doesn’t take a little tumble, which has started but is not enough. But QE will come as the US has no other options to fund its debt and austerity is for other people. Doubt there is time for the market to get down enough for April QE but a May non-meeting surprise would be most effective. Margin use is maxed out so everything, especially the winners like Aaple and gold, gets sold when the margin calls come. Welcome back John. Thought the market would be quieter while you were away but not the case. Your graphs are indeed very interesting, and I especially notice the levels you’ve drawn for gold – they all correspond closely to Fibonacci “retracement” levels of a move from $250 to $2275. The intermediate retracement levels are $730, $1025, $1250, $1500 and $1800. I know that this is using Fib the wrong way around, but I’ve found it useful in the past! So, I think there is a natural level for gold around $2275 already. I agree entirely with your view about the US having no other way to fund its debt. I have a graph (by Louise Yamada) showing a very strong association between US debt ceiling increases and gold, but gold has not yet responded to the last ceiling increase earlier this year. If it does respond, then gold should reach around $2100-$2200 (by my calculations). On top of that, the current debt ceiling is due to be reached by the end of September 2012. I notice a growing number of reports that gold has been forming “normal backwardation” (in the strict sense, where the current spot price is higher than an expected future price). Apparently this is very rare in the PM markets, and most likely caused by a supply shortage pushing up the current spot price. I can well believe this, as most of the recent selling is reported as paper shorting, and the buying as physical buying – ie. those buying physical are likely to want to hold on to it, wheras the paper shorters will have to buy back out relatively soon. Not sure if I’ve seen the graph before but I like Louise. She is as good a gold tech as there is. Fwiw I’ve been buying Jan 200 gold calls (although sold some Jans today) and March 210s in addition to PHYS holdings and miners. Gold will catch up with the debt ceiling; I just don’t think it’s ready to take off now. Gold will fly when Japan devalues, but I just started buying Nov and Jan Yen puts for that scenario. Silver is off by the looks of it. I bought some more at $31.60 yesterday and it seems to be breaking out here. Many thanks! Really great work, much appreciated! Anyone feel free to correct me but quick search says last time Aaple was down when S&P up over 1% was 11/11/11, not quite 6/6/6, but market fell 100+ points over next 8 trading days. Also Fed withdrawing $25 billion next week.